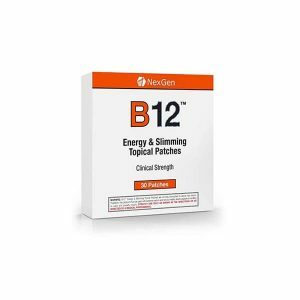 Nexgen’s B12 Energy & Slimming Patches offer consumers an extremely potent and pharmaceutical grade vitamin supplement that can improve a wide range of health markers. 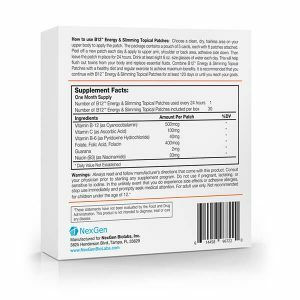 The unique 24 hour delivery system of our comprehensive b12 topical patch formula helps people that can benefit from such supplementation achieve all day results and improved bio-availability. 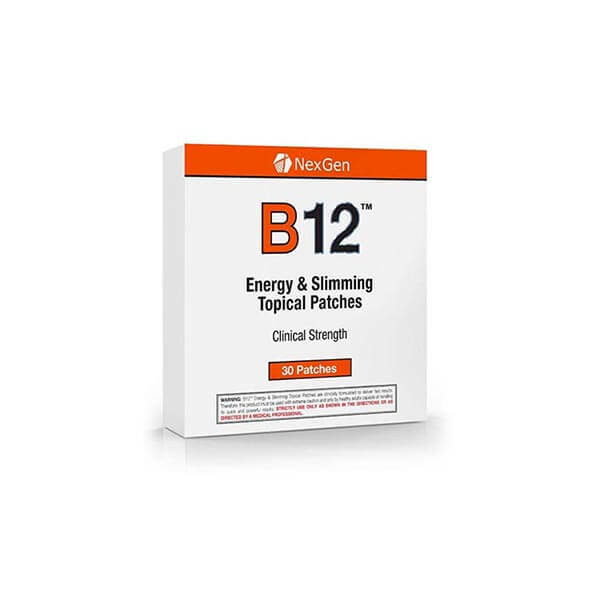 Check out what makes Nexgen B12 Topical Patches one of the best selling b12 supplements of 2016 and learn for yourself the variety of benefits this extremely competitively priced yet high quality product could deliver! How Do B12 Energy & Slimming Patches Work? 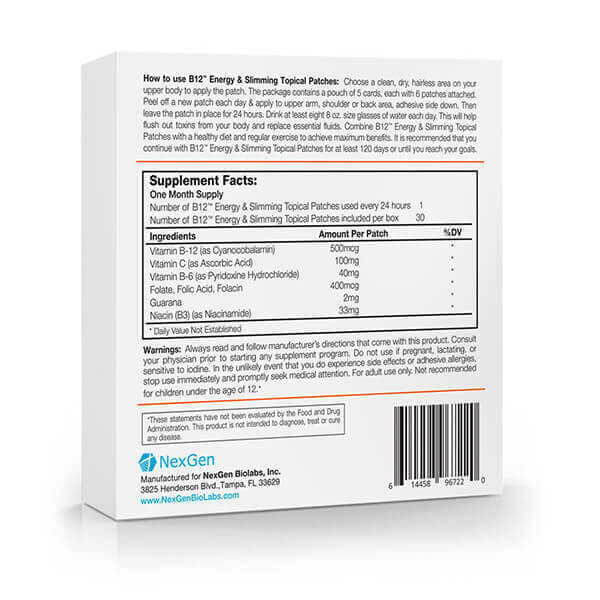 Using pharmaceutical grade, all natural herbal ingredients, Nexgen’s B12 Slimming Patches ingredient profile supplies the body with a variety of high quality nutrients and ingredients clinically shown to aid in weight loss and a variety of general health markers. Our topical patch system provides absorption and delivery in a controlled and time released fashion ensuring wonderful all day results, unique to other delivery systems. Choosing a hairless, dry and clean area on your upper body, place a new patch (separated from the backing) adhesive side down. Leave the patch in place for up to 24 hours at a time while drinking at least eight 8 ounce glasses of water. Increased water consumption will help to flush toxins from your body while replacing essential fluids. Each B12 slimming patch box contains 5 cards of 6 patches. We recommend usage of up to 120 days at a time or until your goals are met. As with any weight loss supplement, combining B12 topical patches with a healthy diet and regular physical activity will serve to potentiate the results. Combining B12 (as Cyanocobalamin) with key co-factor nutrients and ingredients – our product has been noted to be much more potent than average products available over the counter. Advanced topical delivery system provides smooth 24-hour sustained released – improving all day deliver and absorption as compared to other B12 based nutraceuticals. 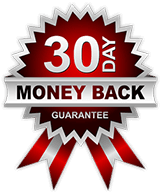 With a 100% money back guarantee, top of the line customer support and free USA shipping available… you literally can see for yourself, risk free, what separates our product from the competition to make it one of the best b12 topical patches on the market in 2016! 1. B12 is good to take because it’s not easily found in foods. Our body needs it. 2. I like the arch idea. More companies are using the patch idea to help distribute vitamins over the 24 hr. Period. 3. How and why it affects weight loss, I have no idea. I have never head of this product before. 4. It says to contact your health care person. In your case, I suggest you call her and have her ok it. 5. I forgot… Check any other ingredients added yo the B12.